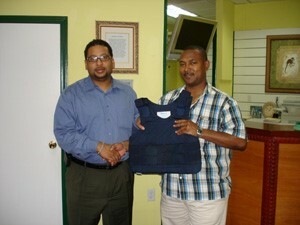 On May 30th 2008, Primier Dental Lab donated six (6) body armour (bullet proof vests) to the Royal St. Christopher-Nevis Police Force. In handing over the equipment Dr. Duane Jones said that his business recognized that there was a need to assist the Police in crime fighting and decided to make the donation. Supt. Ian Queeley, Divisional Commander for District A, accepted the gift on behalf of the Commissioner of Police and thanked Primier Dental Lab for its kind gesture, adding that the body armour will be used the enhance the Police’s crime fighting abilities. He used the opportunity to urge other businesses to do likewise, as it was there cooperate responsibility to ensure that an environment conducive to the conduct of business be maintained. On June 2nd 2008, Mr. Hazarie Ramoutar, Administrator at Ross University donated ten (10) flash lights with wands, six (6) reflective vests and a quantity of batteries to the Royal St. Christopher-Nevis Police Force. In a brief handing over ceremony at the school, Mr. Lynel Nolan, Director of Safety and Security said that students complained of having difficulty recognizing the Police during road blocks at nights, as a result he discussed with the Administrator the possibility of the school making a contribution to the Police to improve their safety. Mr. Ramoutar said that the school recognized its responsibility as a cooperate citizen, to assist the Police by improving their safety while executing their duties. He therefore quickly agreed to the donation of the safety equipment. In accepting the equipment on behalf of the Commissioner, Supt. Ian Queeley thanked Ross University for its continued assistance to the development of the Police Force and assured him that the equipment will be used for the purpose intended. A 14 and 15 year juvenile from Taylors Village were both arrested and charged on Friday 30th May 2008 with the offence of house breaking and larceny. The offence was committed on 27th May 2008 at Taylor’s Range. Trevis Stevens of Douglas Estate was on Saturday 31st May 2008 arrested and charged with the offence of larceny. Cameron Davis of St. Pauls Village was arrested and charged on Saturday 31st May 2008 with the offence of possession of cannabis with intent to supply. Kamal George of Upper Market Street was on 1st June 2008 arrested and charged with the offence of carrying abroad an offensive weapon. The offence was committed on 31st May 2008. Darren Williams of Craddock Road was arrested and charged on 1st June 2008 with the offences of possession of ammunition, possession of firearm, possession of cannabis, battery on police and resisting arrest. The offences were committed on 31st May 2008 after Williams was stopped and searched in Charlestown and one Glock .23 pistol along with nine .40 mm rounds of ammunition and the drugs were found in his possession. The Police are investigating a break-in at the Coptic Orthodox Church situated at Lime Kiln Commercial Park. Investigation reveals that the church was secured on 30th May, and when the Pastor returned the following day he discovered the building broken into and a number of items missing, including a music mixer, VCR and radio and tape recorder. The Police are appealing to any person who has information or who may be approached by any person attempting to sell any of these items to contact the Criminal Investigation Department at tel. no 465-2241 ext 230, 230, or 236 or the crime hotline at 707. At about 4:00 am on June 3rd 2008 Police responded to a report of shooting at Wades Garden. On their arrival they met Leon Sutton of Saddlers on the side of the road with what appeared to be a gun shot wound to his right leg. Sutton reported that he was shot by a masked-man while he was walking along the road. He was taken to the JNF Hospital where he was treated and detained. Investigations are ongoing.